Denim reaffirmed its fashion presence all throughout the womenswear Ready-To-Wear collections at the Fall/Winter 2017-2018 runway shows that concluded last month. The rugged fabric was given a facelift with kick flares, boxy silhouettes, oversized sleeves, applique and cuffed hemlines making a major comeback. Collectively influenced by the worlds of sport and luxe athleisure, workwear-inspired clothing, DIY culture and beyond, double denim coordinates make a modern statement with stylings of formal jackets and jeans while embroidered and embellished patches take on a personal touch. Retro styles are reinvented to create ’70s-inspired pieces featuring a clean and contemporary aesthetic in sync with the demand prevalent in the market today. Oversized proportions and soft touch treatments paired with the dexterous material introduce a sharper silhouette offering a clean-lined take on utility casuals. FFT analyses and presents the key emerging trends in the denim category carefully put together via runway reports and international trade shows for the upcoming season. The classic jumpsuit gets a sharp remake for fall this year, evolving with dungarees and oversized, roomy silhouettes that wear straight fits for a contemporary feel. Materials such as raw denim and compact sateen lend a structured look to the pieces while cinched waists introduce an unexpected twist of femininity to this time-worn ensemble. While the Canadian Tux or denim-on-denim look never really tends to go away completely, this season the trend has seen a major revival by experimenting with casual, daywear style and more sombre, power suiting inspired looks currently making the buzz around town. Designers sent models suited up in tailored silhouettes sporting wide flares bringing forth a professional vibe whilst giving head-to-toe denim a street side makeover by introducing details such as lace up panels, coloured fur patches and button frontals. Designers and high fashion brands alike roared a unanimous approval for the cropped jacket for the approaching Fall/Winter 2017 season. A certain relaxed and laidback attitude reflected in the boxier and outsized proportions, generous sleeves and bust grazing lengths a bit on the androgynous side. Winter denim gets a lightweight makeover as bulky, heavy fabrications are replaced with lighter, but rugged versions imparting a look of contemporary tailoring that is almost tomboy-ish in nature. 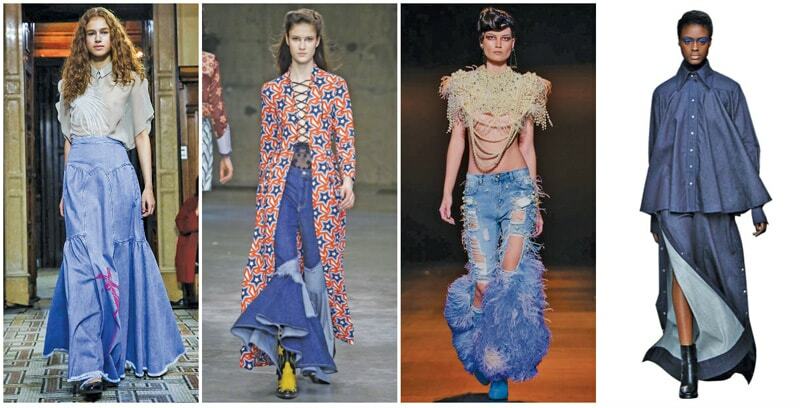 Womenswear denim inspires a ’70s mood with striking patchwork prints in tonal shades of denim blue. Clean lines add refinement to simple cuts, on show in the form of cropped culottes and flared jeans, while more casual DIY looks are formed with pieced-together materials and raw edgings. Double denim styling makes a modern statement with pairings of formal jackets and jeans tonal contrasts. Decorative embellishments introduce a personal and hand-stitched feel to this otherwise rebellious fabric. Floral embroidered patches in high colour threads remain a favourite and continue gaining popularity even this fall. Studs, pearl and crystal encrusted embellishments and paint splashes feature as localized placements in seemingly scattered arrangements. Flares refuse to be set on the backburner and feature aplenty across the womenswear RTW shows for F/W ’17 with designers going all out with respect to experimentation in fabrics, washes and styles. Bidding adieu to last years’ culottes, the vintage trend presents itself dramatic kick flare versions in cropped and floor grazing lengths. Wide leg silhouettes and retro high-waisted square top blocks in darkened indigo weaves, offer a big and roomy fit. Layered under dresses and skirts or worn as is, the rolled up, wide cuff is a definite trend for this fall. The hem stops at or just above the ankle for an ultra-modern appeal. Straight structured looks with square top blocks present themselves in stretch and selvedge fabrics that provide comfort while maintaining an authentic look. Ripped, torn and fringed take on a new meaning this fall with deconstruction coming alive through frayed, uneven and raw hemlines. These techniques can be achieved both pre- and post-laundry. Post-laundered looks appear to be more clean and fine as compared to its counterpart. Exporters’ ‘top 4’ fabric choices for S/S ’17 collections!